There is a growing trend among the governments of Western governments with large militaries (France, Germany, Great Britain, Russia, United States) and their Arab allies (Qatar, Bahrain, UAE, Saudi Arabia) to respond to the challenge posed by Da'esh, the so-called “Islamic State” in Syria and Iraq by sending bombers to limit its advances and degrade its capabilities. Some military people point to various bombing campaigns in the past (Yugoslavia 1999, Tripoli 2011, Baghdad 2015) which have ostensibly been successful as evidence that bombing Da'esh will achieve some kind of tactical victory within a short and limited timeframe. Others point to the American bombing of Vietnam (1965-72) and question the wisdom and utility of sustained aerial bombing. Before we continue further, we should ask: What exactly is Da'esh? Is it a country with fixed physical assets that can be readily destroyed and rendered valueless? Is it rather the manifestation of a certain ideology? What are its origins? What is its morale? What is its power of recruitment? Da'esh, we should remember, has its origins in the invasion and occupation of Iraq. Many of its best leaders, we are told, were once officers of the former Iraqi army disbanded by the American occupiers. If Da'esh seems relentless and particularly anti-American, we will be wise to remember the casualties of the Iraq war numbering in the millions, many of them innocent victims of an indiscriminate US-led blockade, and the humiliation of a proud nation, especially in the light of the infamous atrocities of Abu Ghraib. If we are to understand Da'esh, we must also remember that America today has no power of moral suasion in the Middle East. Most Iraqis hate it for proclaiming their “freedom,” but destroying their country. Iranians have not trusted the US since its democratically government was toppled by a CIA coup in 1953. 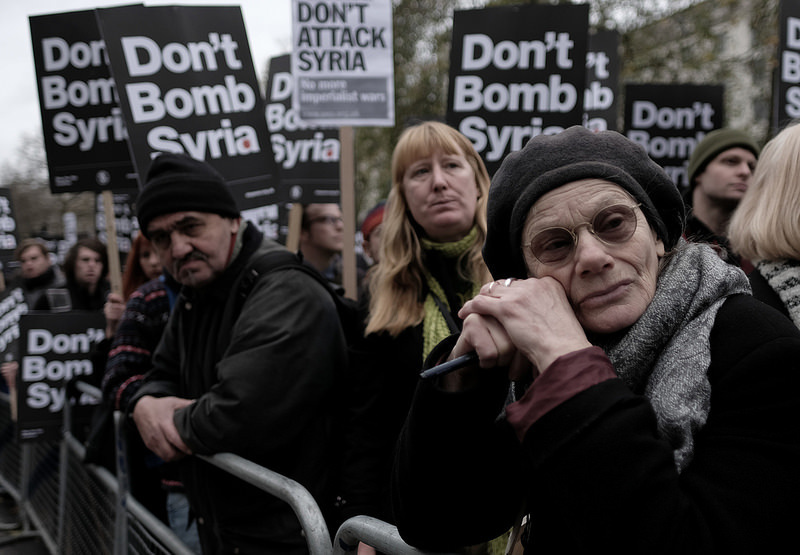 Syrians naturally hate anyone who bombs them. Palestinians deeply resent American support for the government which rendered them homeless and stateless seventy years ago. Throughout much of the Gulf and in Saudi Arabia, common people chafe under autocratic regimes unabashedly supported by the US government, its weapons suppliers, its intelligence networks, and its diplomats. The American government and its military does whatever serves its national interests and cares little for anyone else. Everyone knows this. France, Britain, Germany, and Russia, the other bombers, are all countries whose armament industries sell hundreds of millions of dollars of killing machinery to governments in the Middle East each year. France and Britain have histories of colonial oppression in the region. Russia has its recent history of ruthlessly putting down aspirations toward independence in Chechnia. They too have their interests. Much is made of the so-called “Islamic” characteristics of Da'esh. The Da'esh leadership itself proclaims that it is an Islamic state. Some westerners have come to fear Muslims as hateful, irrational bombers and murderers. Overtly and covertly, this view has been conveyed by various new media and politicians over the years. Special attention has been given to the atrocities of the Da'esh fighters, especially the videotaped killings. There is never, of course, any excuse for killing a fellow human being except possibly in self-defence. These killings and the recent (2015) massacre in Paris are unconscionable. But so also are and were the killings of millions of Iraqis, Chechens, and Syrians who happen to be Muslim by the armed might of western militaries. Moreover, it is a grossly unequal carnage. What western militaries and their proxies do with expensive bombers and missiles from high above and far away, jihadis respond to with cheap suicide vests, improvised explosives and Kalashnikovs. This situation calls for an end of killing. It calls for a return to peace and prosperity. It calls for justice also, but this justice is hard come by when powerful aggressors will not admit their crimes and there is no court in which they can be called to account. While US President Clinton signed the treaty that established the International Criminal Court in 2000, his successor President Bush rejected it soon after coming into in office. Those who are witness to any foreign power's aggression, bombing, blockade or invasion of the country they hold near and dear as their own – if they indeed survive that aggression – will deeply resent it. While some Iraqis did welcome American troops in 2003, soon the invaders were almost universally condemned for the destruction of that country's peace and stability, to say nothing of its civil administration and essential infrastructures. In many respects, they had indeed, as boasted by an American general, been “bombed back to the Stone Age.” Many left the chaos of their homeland as stateless refugees. Others remained and tried to make a bad situation work for themselves and their families. A few joined Da'esh to oppose the West's “New World Order” using their own ideology and culture as a poignant counterthrust. Had Iraq been a Protestant country, surely that response would have taken a Christian tone of moral indignation. As it was, George W. Bush seemed to relish his war on Iraq as a crusade and so naturally the western crusaders found what crusaders always found when they ventured to the holy land: fighters willing to meet them sword for sword and hand to hand. The difference today is that it is not the emirs and sheiks who lead the resistance, it is furious Muslim fighters joined by volunteers from scores of countries who believe in the rightness of their cause. You cannot buy a righteous cause. Neither can you bury the shame of your sins. You can objectify your enemies, make them and their families into monsters in the public imagination through propaganda. You can bomb them, but you cannot kill their fury and their indignation. If you persist, you run the risk that over time the ones you hate will gather followers and enactors around the world. This has already happened and unless we put an end to this folly, it will likely happen again. Sometimes the truth does not set you free. It just makes you angry.